Nowadays the genetic markers are very usual for the diversity and management in different horse breeds all around the world. One of the most important goals for horse breeders is conserving the typical phenotype and characters of horses. This conservation is performed based on selection and inbreeding (Winton et al. 2015). In this regard, the main disadvantage is the homozygosity of undesirable alleles in the populations, which results in the reduced level of genetic variation, that in turn leads to lots of defects and susceptibility to recessive diseases (Shahsavarani et al. 2010). DNA genotyping by microsatellites is usually used for determining genetic diversity and parentage testing. However, there are inherited regions of DNA that can vary in different creatures. Variations in DNA sequence are named “polymorphisms”. As findings show, sequences with the highest degree of polymorphism are very useful for DNA analysis in paternity verifications. This term is based on analyzing the inheritance of a class of DNA polymorphisms known as Short Tandem Repeats (STR). STRs are short sequences of DNA, normally of length 2-5 base pairs, that are repeated numerous times in a head-tail manner. The polymorphisms in STRs are due to the different number of copies of the repeat element that can occur in a population of individuals. On the basis of different repeat units, STRs can be classified into different types. On the one hand, according to the length of the major repeat unit, STRs are classified into mono-, di-, tri-, tetra-, penta-, and hexanucleotide repeats. The total number of each type decreases as the size of the repeat unit increases. Short tandem repeats (STRs) like microsatellites represent lots of advantages including codominant inheritance and extreme polymorphism (Miller et al. 1988). This study determined short tandem repeat (STR) and allele frequency of Arab and Caspian horse breeds in different regions of Iran using four loci (VHL20, AHT4, HTG4, HMS7) recommended by the (ISAG). 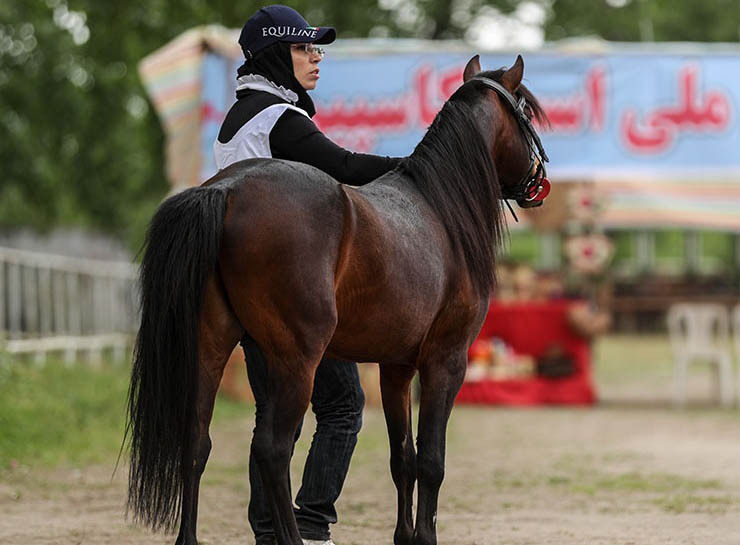 Blood samples were collected from 37 Iranian horse breeds (East Azerbaijan and Gilan provinces). EDTA as an anticoagulant agent was used in blood tubes. Genomic DNA was extracted and purified by salting out method from whole blood (Miller et al. 1988). Then, DNA concentration was evaluated using NanoDrop at 260 nm. Next, four microsatellite markers were used as labelled with fluorescent dye (6-FAM) (Table1). Afterwards, multiplex PCR was performed in a total volume of 25 μl using the following cycling. The first denaturation at 95˚C for 5 min followed by 25 cycles at 95˚C for 30 sec, 59˚C for 1 min, 72˚C for 30 sec, and a final extension at 72˚C for 5 min. PCR products were checked through electrophoresis on 1/8% agarose gel. Then, they were genotyped by capillary electrophoresis on Genetic Analyzer ABI PRISM 3100 (Applied Biosystems, USA). The size of alleles was measured by fluorescent fragment analyzer Gene Marker genotype software and the alleles per locus were calculated by counting. Genotypes showed the mean number of alleles 7.5 in Arab horses and 7 in Caspian horses. As regards that mean observed heterozygosity (Ho) 0.761 in Arab and 0.799 in Caspian horse also expected heterozygosity (He) calculated 0.779 in Arab and 0.84 in Caspian horse. The equine microsatellite was introduced by (Ellegren et al. 1992). In the present study, the highest number of polymorphism was 10 for AHT4 locus in Arabian horses compared with 9 in Egyptian Native horses (Mahrous, Hassanane et al. 2011). Two Iranian horse populations (Caspian and Arabian) had high heterozygosity. Iranian Caspian pony heterozygosity (0.84) was higher than that of UK Pony (Winton, Plante et al. 2015). This result was even higher than what was obtained in another study 0.605 (Amirinia et al. 2007) and lower than 0.8 (Shahsavarani et al. 2010). These kinds of studies help in assessing genetic diversity for conservation, management and breeding program in horse breeds. The number of alleles and heterozygosity level in four loci in our studied population showed higher genetic variability and polymorphism.